#Superyacht - Sailing tests have begun on what’s purported to be one of the world’s largest sailing yachts, as Mail Online reports. Sailing Yacht A’s functional name is very much an understatement, as this enormous vessel is more than 140m long, comprising eight decks with 90m masts, making it more like a skyscraper than the boats moored at your local marina. Priced at some €365 million, and designed by the renowned Philippe Starck, the luxury ship was built in Germany for Russian billionaire Andrey Melnichenko as a replacement for his 2008 vessel Motor Yacht A, another Starck design. The new A also boasts the latest in sailing technology, with digitally controlled sails, a carbon-fibre-impregnated hull and bomb-proof glass. It’s not the only superyacht in the news, as Royal Huisman has taken an order for its largest vessel to date — and the largest aluminium hulled yacht yet conceived — at a comparatively modest 81m in length. Yacht Harbour has more on the story HERE. Dun Laoghaire harbour welcomed the Maltese flagged cruising superyacht 'Ganesha' this morning. The 46 metre sailing yacht arrived into the Irish east coast port and took a prime marina berth, she's the second superyacht appearance in a month for Dun Laoghaire, record breaking Rambler 88 arrived in port prior to last month's Round Ireland race. The 46m Vitters build is named after an Indian deity and is a regular on the international superyacht regatta circuit. Superyachts are becoming regular visitors to the Irish coastline as facilities such as coastal marinas improve. Kinsale welcomed The 55m ‘Galileo G’ in May and this month the south coast port received the 73m Grace E arrived at the yacht club marina. With aerial views of the Charles Fort, James Fort, visiting Super yacht 'Grace E' and the town marina, Kinsale is filmed by drone pilot Daniel Foran with spectacula results for the harbour that marks the start of the Wild Atlantic Way. Now regular visitor Superyacht ‘Air’ returned to Cork this morning. The yacht is moored off Cork Harbour anchored off the spit lighthouse in Cobh. This black hulled Dutch-built Feadship was launched in March in 2011 and called to the Irish South coast in 2012 and in 2015. The yacht is available for charter at the reported rate of €750,000 per week. Onboard luxury inlcudes a helicopter pad and 102-inch pop-up movie screen. If the superyacht follows her usual Irish itinerary then she will move on to Kinsale where she anchors in the mouth of the harbour and tenders in and out. Last year they anchored in the lee of the old head and the onboard helicopter flew from the boat up to the golf course. See our 2015 photos of the superyacht. Only 24 hours day after the world’s largest privately owned yacht sailed into Cork harbour, a second Superyacht arrived in Kinsale this afternoon. In an early season boost for the Cork coast, the massive yachts make a fine spectacle in both harbours this evening. The ‘Galileo G’ is a 55m Perini Navi ice class steel displacement hull built in 2011, British flagged and has accommodation for 10 guests and 12 crew. It is powered by two caterpillar engines with a cruising speed of 11 knots giving it a range of 9,000 nautical miles. 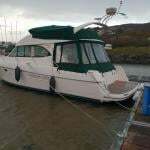 ‘It is great to see boats of this calibre now becoming regular visitors to the area', said local yacht broker John McDonald of MGM Boats who welcomed the boat into the town. The AGM of the Irish Marina Operators Association (IMOA) took place this month at the end of another successful season. The news from around the coast is that visitor numbers are excellent with Irish marinas attracting large numbers of boats from Britain, France and Norway in particular. Superyachts continue to see Ireland as a new and exciting destination as well as smaller cruising boats from all over the world. Some marinas are filling up again with demand being seen for larger berths in particular. Marina operators are also investing significant sums to upgrade and improve the existing facilities. #kinsalesuperyacht – Kinsale is a destination of choice for superyachts with a second making a call to the south coast harbour within a week. The 35–metre Vitters built SY 'Ghost' is moored at the Blue flag Kinsale Yacht Club marina this morning and expected to stay until Saturday morning. The lightweight high performance sailing yacht has a carbon fibre hull and superstructure, the first of its kind for the yard. Her visit follows a return visit from MY 'Air' currently anchored in the shelter of the Old Head, an 81m Feadship. #superyachtvisit – Return visitor to Ireland, the 81-metre long super motor yacht 'AIR' cut a dramatic pose as an early season caller to Cork Harbour yesterday. As Afloat reported previously, this black hulled Dutch-built Feadship was launched in March in 2011 and called to the Irish South coast in 2012. The yacht is available for charter at the reported rate of €750,000 per week. Onboard luxury inlcudes a helicopter pad and 102-inch pop-up movie screen. The largest yacht ever to be built at the Koninklijke De Vries yard, AIR has a sleek and elegant exterior with modern lines, it has a matte black steel hull, and an aluminium superstructure. She measures 265.7 feet in length and has a beam of nearly 39 feet. 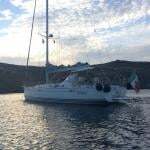 Extremely spacious, the vessel can accommodate 12 guests in 7 roomy staterooms including an impressive split level owner's suite, two guest cabins on the upper deck, one cabin on the main deck, and three on the lower deck. The owners' observation lounge offers a breathtaking view over the eight-meter long pool on the main deck's forward area.